DiabetesDaily. 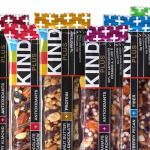 Product Review: Kind Bars & Gluten-Free Granola! If you’ve never a KIND Bar or their granola, you can find them in most grocery stores, usually in the gluten-free/health foods isle.